On a wet and windy Sunday morning, Ms O’Donoghue, Ms. Kelly and I made our way from Dublin to Oranmore in Galway to attend a National Umpire course. The course was being presented by Master Robert Howard VIII Degree and Master Mark O’Donnell VII Degree. It was a new experience for us. It was the first time we were stepping beyond the student and competitor role into one of the umpire. The course was well attended having ten attendees, so it was nice to know that this journey was not only new to us but also to catch up with familiar faces and colleagues against whom we had been competing for years. The course was broken into two parts, a classroom session followed by a practical interactive session. Like most people who have competed and watched competitions, I believed that I had a decent understanding of what umpires are required to do, but as the old saying goes “You learn something new every day” and on this particular day there were a lot of new somethings. The importance of impartiality and fairness is a key fundamental part of being an umpire. This was stressed on a number of occasions and every time a new competitor takes to the floor; they deserve your concentration and honest evaluation. We started with patterns, what to watch for, scoring elements etc. We then watched videos of people performing their patterns and put what we had learned into practice. We continued through the morning with practical assessments on how to umpire in all of the competition categories, special technique and power, finishing in the afternoon with practical umpiring at sparring. It was an immensely enjoyable day and from speaking with all attendees I can honestly say we all left equipped with more information than we started with. For any new Black Belt’s , I would recommend their attending this course without any hesitation. Grandmaster Howard’s Taekwon-Do School is delighted to announce that it is hosting another high quality sparring seminar with Mr Konstantin Yurikov from Russia. This sparring camp is part of a series of excellent training weekends with the multiple World and European Taekwon-Do champion. 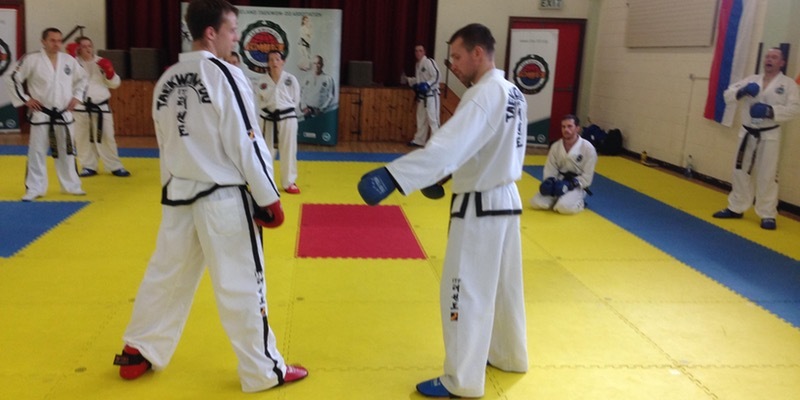 The camp will build on the previous skills and techniques taught at the last training camps, but is accessible to new and experienced black belts and colour belts alike (yellow belt and above). If you are interested in developing your sparring skills for both competitions and gradings then this event is for you. Places are limited due to space, so book early and don't miss out. The last camp was fully sold out. Saturday is at the Cabra Parkside Sports Complex, Ratoath Rd, Dublin 7. Sunday is at the St Joseph's School, Navan Road, Dublin 7. Attached please find the application form to attend the National Black Belt Class, conducted by Grand Master Phelan to be held on Sunday 12th March '17 from 11am -1.00pm in St Marks Taekwon-Do School. This is a fantastic opportunity to learn, develop and meet your fellow Taekwon-Do students from other schools. On behalf of the R.I.T.A Tournament Committee, I would like to invite you to the ITF Ireland Cup 2017 to be hosted in Kingfisher Sports Club, NUI Galway Sports Centre, University Road, Galway. · Power will only be open for Senior and Veteran competitors. Further details of the event and Link to the application form are available on www.rita-itf.org. It was a good weekend for the RITA Colour Belt Squad and National Black Belt squad at the INTA Open International in Co Meath. The two squads competed well and gain a lot of experience for the upcoming English open and European Championships. The event was a good opportunity to see were the competitors training plans were at and to see how they perform in the pressure of a high level competition. The event had 600 competitors from both Ireland an abroad and was a good test for the RITA squad. The students gained a lot of experience and got a chance to try out new techniques in the ring. The 40 medals overall between the two squads were a nice reward for their hard training and commitment. A special well done to Grandmaster Howard’s students from both squad who performed so well. Thanks to the INTA tournament director Mr Wezelman, the INTA masters and umpires who ran an excellent event with very fair judging. The next big tournament on the RITA calendar is the ITF-Ireland Cup on the 1st of April 2017 in Galway city. Looking forward to seeing you all there.